After a 5-11 finish in 2017, it’s safe to assume that big changes are coming for the Denver Broncos over the course of the next few months. For the third season in a row, the talk of the town will be the quarterback. Despite a valiant effort, even the talented Denver defense couldn’t carry John Elway’s quarterback patch-job to the playoffs for the second-straight season. It sounds like Elway has learned his lesson. Mike Klis of 9News told the team’s radio partner on Thursday he believes major changes are coming on both sides of the ball this offseason. When it comes to the quarterback room, Klis says there is a good chance that of the three quarterbacks who saw playing time last season — Trevor Siemian, Brock Osweiler and Paxton Lynch — only Lynch will be retained. 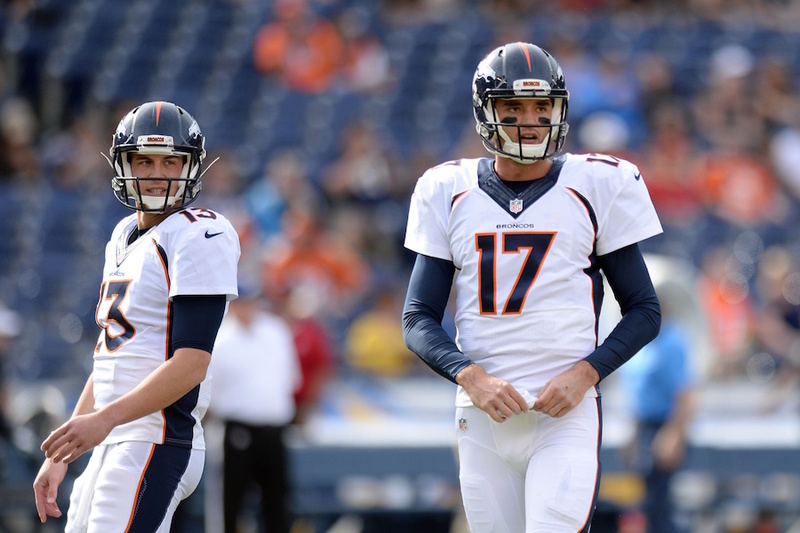 Osweiler signed a one-year deal last preseason after Lynch went down with an injury. The Broncos appear content to let him walk. Siemian has one year remaining on his contract, and would carry just a $13,198 dead cap hit, according to Spotrac, if the Broncos are unable to trade him and decide to release him. Lynch has two years remaining on his rookie contract and a possible fifth-year team option as a first-round pick. Klis also said in the radio appearance that there is a chance that they could clean house entirely, leaving Chad Kelly — a 2017 draft pick who spent the entire season on PUP/IR — as the only quarterback in the room. If either of these two scenarios do turn out to be the case, it’s about time. It unfortunately had to happen during perhaps the final two years of the once-dominant Denver defense’s prime, but the patch-job didn’t work. Even if 2015 looked like a deviation from the norm, the NFL is a quarterback-driven league and the Broncos need one in the worst way. The Broncos have enough pieces on defense to squeeze out one more year of top-tier play, but it’s impossible to predict the future. If Elway and Company do decide to blow up the Broncos’ quarterback room, it would only be doing the defense a favor. The window for a great defense is a small one, and it’s closing quickly. Before the Broncos can think about making the playoffs they need to find a way out of the cellar of the AFC West. Whether they start from scratch or decide to retain Lynch until (or if ever) he proves capable of leading a NFL offense, they’re making the right move. Change is inevitable, and the change the Broncos need to make at quarterback is one that should’ve been made before 2017. But hey, hindsight is 20/20. At least it appears Elway is finally seeing clearly now.